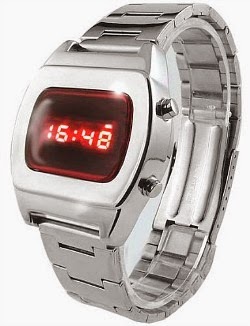 Digital Watches first launched in the 70s and featured a red LED display. Seiko and Texas Instruments were amongst the first companies to take them into mass production. However, they were problematic and used so much battery power that you needed to replace the battery every couple of weeks or so. Because of this, they were soon replaced by the more convenient LCD watches, and Casio became one of the market leaders during the 1980s. As with many new electronic gadgets, the watches soon became more complex, and companies competed with each other to cram as many features as they possibly could into a wristwatch. 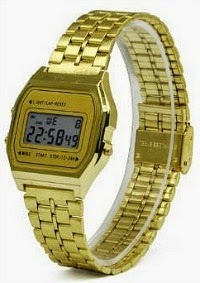 Casio released their now iconic calculator and databank watches, and Seiko launched their first TV watch in 1982. Amusingly, some even had built-in thermometers, and trying to buy a watch to actually tell the time became irrelevant. My parents bought me my first digital watch in 1982, which was made by Texas Instruments. It was pretty basic, but featured a cool glow in the dark luminous green background. 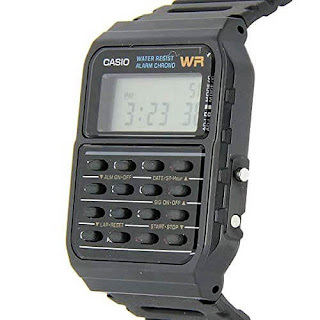 Watches quickly became ever more complex, and within about a year everyone wanted the new-fangled calculator watches. In 1984, I persuaded my parents to buy me a Casio model for Christmas which had a built-in Space Invaders game. Indeed, there were so many features that actually remembering where the time mode was on the darn thing became almost an impossibility - you could find yourself spending half a day frantically pressing the buttons just to get back to the time mode! If you were a YUPPIE or were fortunate enough to have parents with plenty of money, then a gold calculator or databank watch was the No.1 choice. The rest of us had to suffice with cheap gold tone or a black plastic strap. There are plenty of retro style digital watches available today with a 1970s or 80s style. There is a lovely selection of 70s LED watches at Amazon.co.uk which look exactly like the one my Dad owned back in the day. Starting at little short of £50 they're not cheap, but for retro coolness they can't be beaten. There are a few cheap LED digital watches which would be ideal if you're on a tight budget and for fancy dress purposes. If you want a truly authentic 80s watch with lasting appeal then it's worth paying a bit more. Casio are still producing some of the exact same models they were around three decades ago, but with improved technology inside the casing, of course. Let's take a look at the models available. This is the modern day version of the water resistant Casio CA-53W calculator watch that Michael J. Fox wore in the iconic 80s movie Back To The Future, and it looks identical. 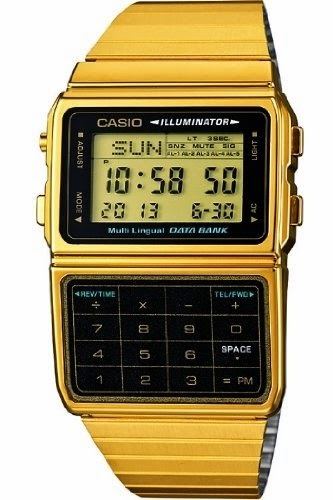 Most calculator watches were very fiddly to use, and I remember using my pen to press the buttons. If you popped down to your local market at the weekend back in the 80s, then a cheap plastic calculator watch (often made in Hong Kong) like this would have been popular. Whether it actually worked was a risk you had to take, and chances are the seller would have disappeared when you returned the following week! Now, this looks very much like the watch I bought in the latter half of the 80s, except mine had a black plastic strap because that's all I could afford at the time. Whether gold-toned or not, this model was a lot less complicated to use. Gold watches became highly popular, particularly amongst YUPPIES - remember them? However, to be a true YUPPIE you needed a Casio Databank. 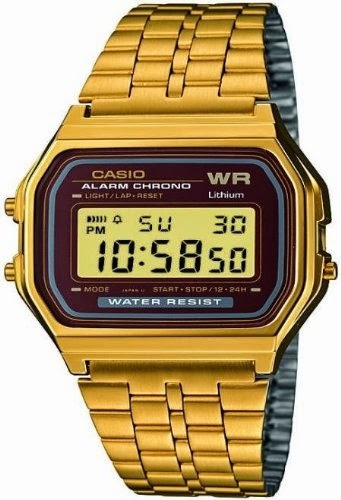 This is from Casio's retro collection and look's exactly how I remember them. These were far too highly-priced for someone who was in their late teens (as I was) but very suitable for anyone who had some cash to spare, such as your boss! The following watches are typical of the popular models we were all wearing in the 1980s and can, fortunately, still be bought today. I particularly like the Timex Indiglo with it's luminous green display that reminds me of my first aforementioned digital watch by Texas Instruments.